Gujarat High Court Notification is out. Gujarat High Court is recruiting for 124 Civil Judge Govt Job Posts. You can check Gujarat High Court - High Court of Gujarat last date, download Gujarat High Court notification, visit Gujarat High Court official website and check other Gujarat High Court Vacancy details.Complete Vacancy and recruitment Details about 124 Civil Judge Govt Job vacancies in Gujarat High Court are provided below by JobSarkari.Com only for you. Last Date for Apply Online 01/03/2019. Date of Preliminary Examination 05/05/2019. Date of Main Written Examination 07/07/2019. SC / ST / SEBC / PH Rs.500/-. Mode of Payment Application Fees Can be Submitted through Online Mode using SBI ePay or through E-Challan Making Payment at Any Branch of SBI Bank. Civil Judge 63. 33. 09. 19. 124. Candidate Must Have Passed Degree in Law and Practicing as an Advocate in Civil Court and / or Criminal Jurisdiction. For SC / ST / SEBC / PH / Ex Serviceman 38 Years. Relaxation For Upper Age Limit 40 Years. 1. Preliminary Examination (Elimination Test). 2. Main Written Examination (Descriptive Type). 3. Viva-voce (Oral Interview) Test. 2. Candidate Have to Registered on OJAS Portal through Mobile Number before Applying For the Post. 3. Candidate Need to Fill All the Mandatory Details Given in Application Format. 4. Read all the Instruction Carefully Before Submitting the Form and Save the Online Application by Clicking Save Button. 5. Login with Application No and Date of Birth and Upload the Scanned Photograph and Signature in the Prescribed Format. 7.Online Application can be Submitted On or Before 01st March 2019. Q. 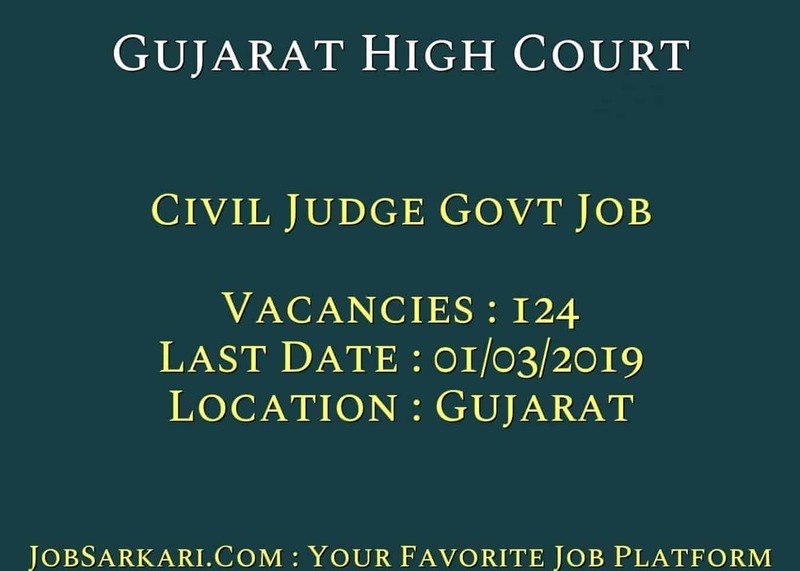 What is the Last Date For Gujarat High Court Civil Judge Govt Job Vacancy ? A. 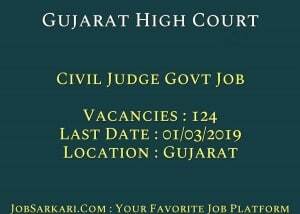 Last Date for Gujarat High Court Civil Judge Govt Job Posts is 01/03/2019. Q. What is the Form Type of Gujarat High Court Civil Judge Govt Job Recruitment ? A. The Form Type for Gujarat High Court Civil Judge Govt Job Posts is Online. Q. How many vacancies are available in High Court of Gujarat Civil Judge Govt Job Posts ? A. There are about 124 Vacancies in High Court of Gujarat Civil Judge Govt Job Posts. Q. What is the Full Form of Gujarat High Court ? A. Full Form of Gujarat High Court is High Court of Gujarat .